Destinations MapEcuador Train Routes and destinations' altitude and distances. 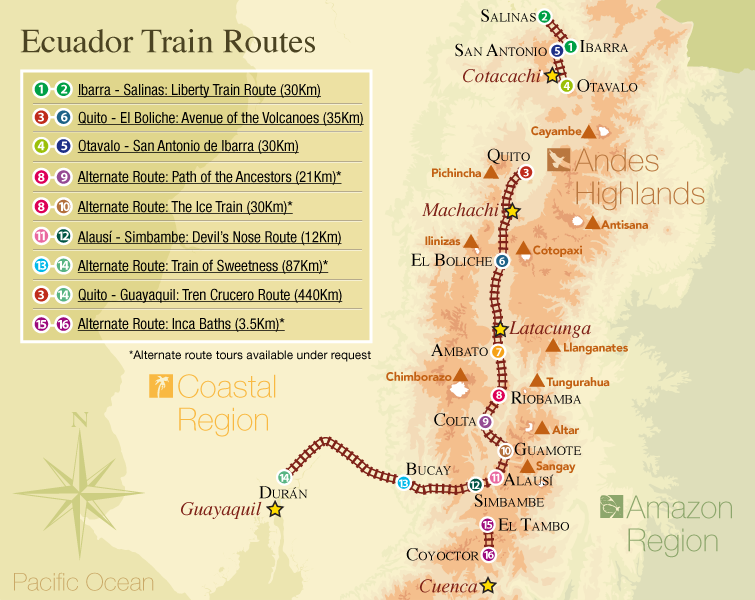 About the TrainsThe renovated rail system of Ecuador features the following train options. All Ecuador Train ToursDiscover Ecuador's natural, cultural, ethnic, culinary and climatic diversity. Prepare for an amazing expedition through the Ecuadorian Andes and Pacific Coast regions... An immersion into the culture, customs and traditions aboard very distinctive trains. Columbus Travel introduces the latest rail travel packages including train rides to the Northern Andes and its diverse blend of cultures; the Avenue of the Volcanoes, featuring the Cotopaxi Volcano and Machachi –home of the Andean "chagras" and their colorful indigenous markets–; and a comprehensive journey departing from Quito to the coastal plains aboard the Tren Crucero.